François Schuiten, cartoonist and scenographer ; Benoît Peeters, writer, screenwriter and critic ; Bruno Letort, composer, guitar and keyboards. A fantastic tale told through images, music and voices. The adventure of the last child of Taxandria, the country of the eternal present: this is the new "conference-fiction" proposed by François Schuiten and Benoît Peeters, the authors of the Cités obscures, in collaboration with the musician Bruno Letort. A dive into a surreal world disturbing and fascinating at the same time. 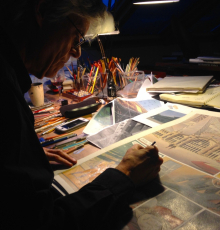 The story, Souvenirs de l’éternel présent, has its origins from the film Taxandria by Raoul Servais to which François Schuiten has ensured the graphic design, creating hundreds of drawings. Aimé, a child around ten years old with a bald head, lives in Taxandria, a city in ruins, filled with Corinthian columns and large deserted palaces. Following a mysterious cataclysm, the laws of "the eternal present" have been promulgated in Taxandria: all references to the past and the future have been forbidden and all machines have been banned. Aimé discovers a picture book recounting these terrible events. He is upset by this reading and nothing can stop him now. Will he manage to escape the grim hold of the world of the eternal present.